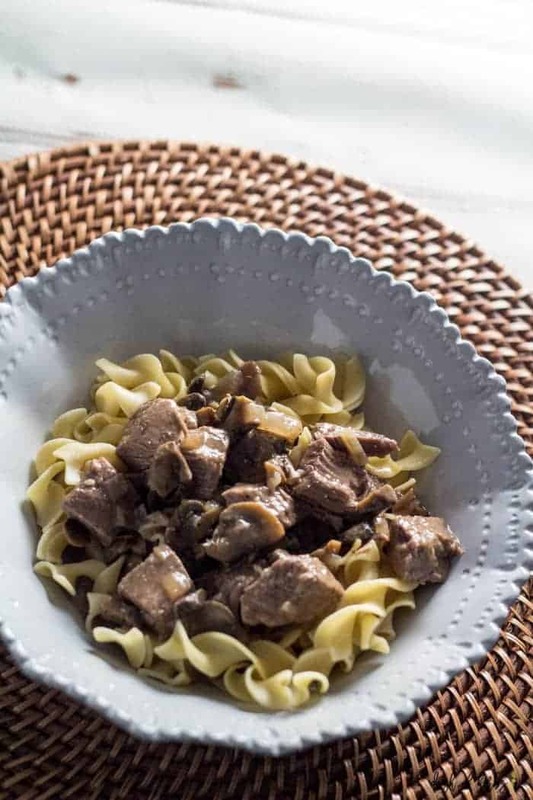 If you are craving comfort food, look no further than this slow cooker beef stroganoff recipe. 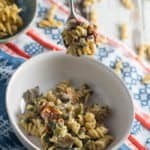 It is only 9 Freestyle points per serving, and is so filling. It’s also incredibly easy to make, but tastes like it took you a lot of time in the kitchen. Wow those guests! Weeknights can be rough – especially if you have to cook after a long and tiring day at work. So, that is why I have leaned so heavily on my slow cooker lately. It allows me to cook healthy meals without having to slave in the kitchen (or feel like I am slaving in the kitchen). Does anyone else feel that way? I just love that after having a baby, I can still make healthy food easily. 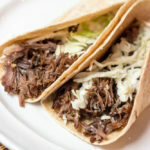 The slow cooker was honestly a lifesaver for us when I was on maternity leave. When I am wanting a healthy recipe, but I don’t want to do the work to cook it, I will create a slow cooker recipe. And this one is fantastic (my husband actually wanted me to try a beef stroganoff recipe). 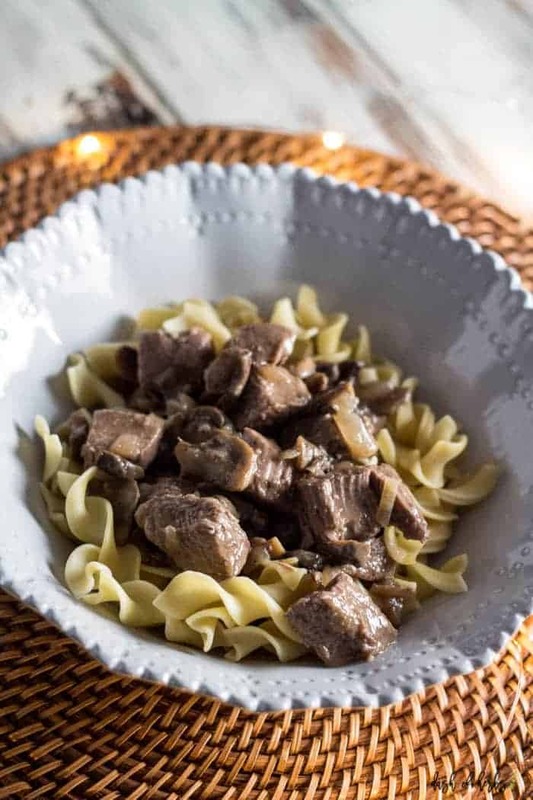 When I was growing up, I only at beef stroganoff when it was a frozen dinner…so it’s not something I grew up loving, but there is something so wonderful about the savory flavors coming together and the beef melting in your mouth. 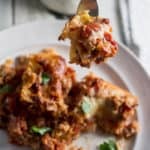 This recipe has turned me into a believer – and it’s one that I will be trying again and again because it’s so delicious! Thank you. 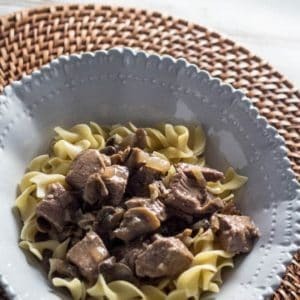 It’s wonderful and even though it isn’t as creamy as regular beef stroganoff, it still tastes the same. 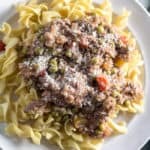 Your recipe is so much healthier than the one I currently have — can’t wait to try! I love it too (even though I didn’t realized I loved it until recently). I hope you love it as well! 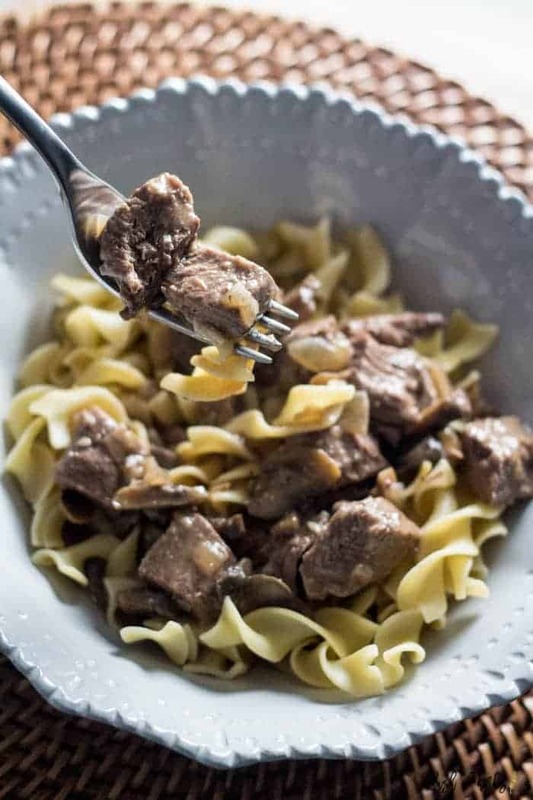 Beef stroganoff is one of my most favorite meals ever! Thanks for sharing this!! I can’t wait to make it! !